Number search puzzles are a perennial favourite. They are of course a variation on the even more popular word search, that enduringly popular puzzle. With number search puzzles there are a list of numbers hidden in the grid. They might be hidden in a horizontal, vertical or diagonal manner - and either forwards or backwards. You must find each of the numbers in the grid and cross it off when you find it. 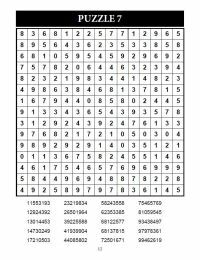 That is all there is to the number search puzzle, but number search are harder than word search as there are only ten symbols in the grid, not 26 as with word puzzles, and therefore a lot more repetition of numbers and hence more potential false starts. This makes them a harder puzzle and you'll need all your number finding skills to successfully complete the book of number search and all 100 puzzles therein. Harder than Wordsearch - Number Search! Why are number search harder than word search puzzles? The answer is that there are 26 letters from A-Z, but there are only 10 digits from 0-9. This means that there are more false leads, or more 'noise' in a number search grid. It is highly likely that every number appears in at least one of the numbers to be found in the number search. However, with word search puzzles there are very likely some letters that can be fully discounted - for instance Q, Z, J, X or at the most they will appear in one word and therefore be a giveaway. With number search this won't be the case - because there are only ten numbers they are more likely to appear several times, and since the numbers are regularly chosen there are no letter frequencies to deal with. The bottom line of all this is that you will need to do proportionately significantly more searching to find the numbers in number search than you will to find words in wordsearch puzzles. And since words are more memorable than numbers, this too adds to the challenge. So the bottom line is that number search puzzles are ideal for those who enjoy the way that wordsearch puzzles work, but find them too easy. This is the next step up! 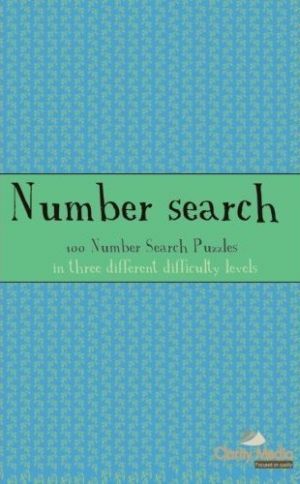 But the good news is that the solving rules are the same, so if you enjoy wordsearch but want a trickier challenge, then these number search puzzles could be ideal for you. Let us know what you think, and if you have any ideas for other word or number type puzzles that you would like to see, please do just let us know!